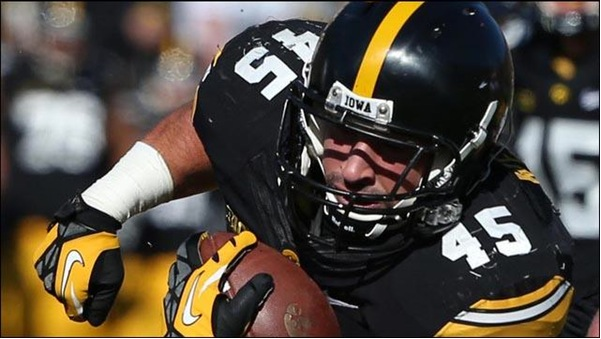 Could Iowa’s Mark Weisman be the Green Bay Packers’ starting fullback next season? The Packers haven’t re-signed Pro Bowler John Kuhn. Kuhn, a free agent, will turn 33 on Sept. 9 and it appears the team hasn’t shown a ton of interest in making a move to bring back the popular fullback. Weisman, despite not being picked for the Scouting Combine, made his statement to be the No. 1 fullback in this year’s draft. Weisman turned in a jaw-dropping workout at Iowa’s pro day on Monday. — Of the 25 backs to run the three-cone drill at the Combine, only four were faster than Weisman’s 6.88. — Of the 32 backs who did the broad jump, only four jumped further than Weisman’s 10 feet, 3 inches. — Of the 26 backs who performed the short shuttle, only nine were faster than Weisman’s 4.17. — Of the 29 backs who did the vertical jump, only eight jumped higher than Weisman’s 36 inches. More than just a workout warrior, Weisman’s career totals include 599 rushes for 2,602 yards and 32 touchdowns over just three seasons after transferring from Air Force. As a senior, he was a second-team Academic All-American by rushing for 812 yards. His 16 rushing touchdowns rank third-best in school history. With his ball-carrying skills, intelligence and athleticism, Weisman appears to be a perfect fit for Green Bay’s offense — just in case the Packers are moving on from their popular fullback.